The X-Shop Kids Telescope, true to its name, is designed to help parents introduce their children to astronomy. It is designed with simple features, making it ideal for beginners. The telescope is created compact and lightweight. 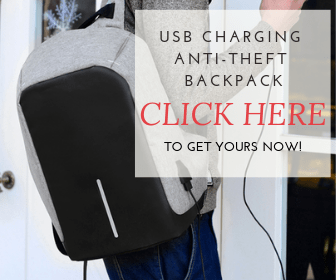 You can use it when traveling or mount it on a tripod on top of a table for easy use. This telescope is offered with simple features, making it easy to use for children. Even while this is a toy telescope, it is offered with three eyepieces, offering adjustability when you are viewing different objects. The telescope sets up in less than a minute. However, you should not let kids set it up alone. What is X-Shop Kids Telescope? The X-Shop Kids Telescope is designed to allow kids explore space and nature. It allows them to see the moon, the lunar craters and the lunar surface features. When using low magnification, you can see the stars. 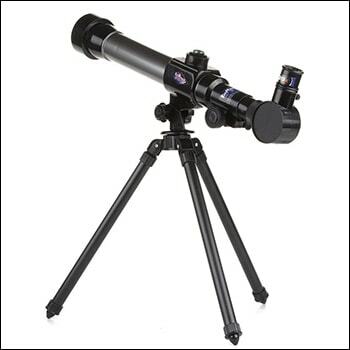 Besides using this telescope to watch celestial objects, you can use it for bird watching. The telescope is offered with a protective lens and eyepiece cover. This enhances the life of your lenses, keeping them free of scratches. It is offered with a view angle and focus adjustor, allowing you great control. To use, open the tripod and screw the telescope on it. Slip the eyepiece in it, point and view. The focus adjustor lets you regulate the focal length for good focus. 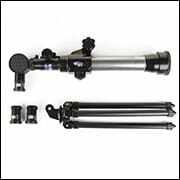 The tripod offered with the telescope rotates 360 degrees, allowing you control. 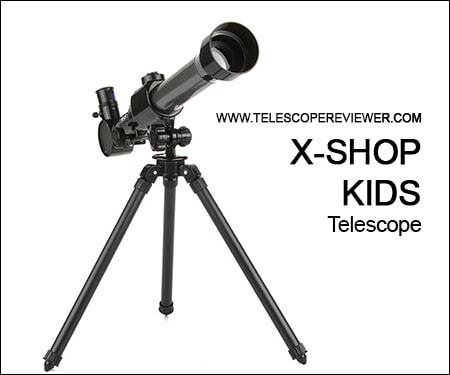 You can buy the X-Shop Kids Telescope online. It usually costs between $25 and $30. The manufacturer also sells the telescope. While the unit is offered at a great price, there are discounts at different times of the year. You can also buy used telescopes whose prices are significantly low. The X-Shop Kids Telescope is a telescope for kids and in most cases referred to as a toy. However, it gives clear images for hobbyists, entry-level astronomers and children. 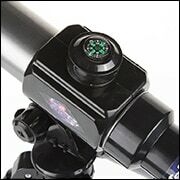 It is offered with three eyepieces, allowing you great adjustability. The eyepieces are 20x, 30x and 40x. With a 60mm aperture and a 170mm and focal length, the unit delivers high quality images for beginners. However, those looking for professional images might need to buy a better unit. Seeing that this unit is created for kids, it is offered easy to use, but with high quality features. The reflector telescope does not connect to a computer and it is, therefore, not useful in photography. However, it is offered with a map, letting you get started immediately. On the lens of this telescope, you can see the moon, the stars, planets and other celestial objects. When observing terrestrially, you can watch birds, wild animals and even insects. The X-Shop Kids Telescope is a reflector telescope for budding scientists. Though it is a toy, it is offered with a professional telescope design to introduce kids to professional telescopes. However, it is missing on some features such as the Finderscope that might help children learn more on how to focus on professional telescopes. Seeing that this telescope will be used by kids, care will need to be taken to ensure it does not fall off benches and tabletops. The telescope also need to be cleaned to rid it of dust. The lenses are offered with a cover, making them easy to clean without the worry of scratching them. A soft lens cloth should be used to clean the lenses and the eyepieces. You can also use a camel’s brush to clean the lenses. If all the telescope has is dust, you can blow it off with an air can. 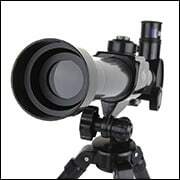 You can buy additional eyepieces for better magnification. While the box offered with the telescope will cushion it and keep it protected, you might need a backpack when you need to carry it around. Besides these items, the unit is offered with an instruction manual. The manufacturer offers a guarantee of quality, allowing you up to thirty days to return telescopes that are faulty. You are also offered one-year manufacturer warranty as proof of quality construction. While the plastic construction might look flimsy, most users say that they have used their units for a long time without any problems. There are many toy telescopes on the market today, but not many offer the quality that the X-Shop Kids Telescope offers. The clarity and crispness of images that it delivers are enhanced by the quality eyepieces, the comparatively high aperture and relatively long focal length. You can use it for bird watching and sightseeing, or you can buy it for your kids to study astronomy; either way, it offers you value for money. Setting up this telescope is easy, seeing that it is not offered with a mount that adds a step in the installation process. Your kids will have fun, but you might need to teach them how to use it. What is your experience with toy telescopes? Do you think your kids will fancy this unit and the features it sports? Talk to us.